The path to enlightenment has a stopover in New York’s Chelsea, one that a traveler might never want to leave–the Rubin Museum of Art. This is especially true on a Friday night, when admission is free and the café morphs into the K2 Lounge, allowing urban Bodhisattvas to mingle and mix the bubbly with the Buddha. 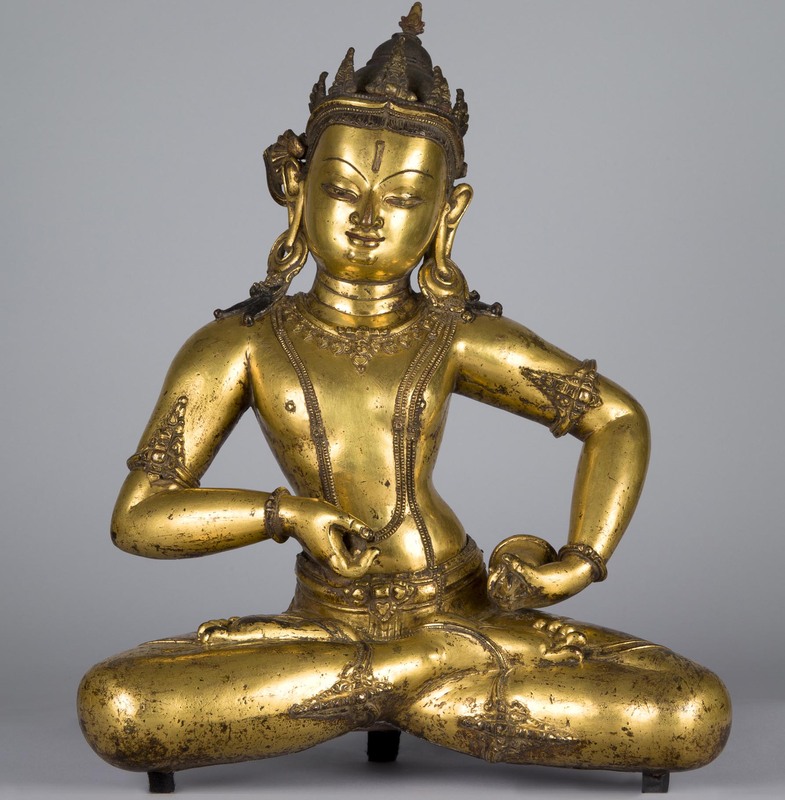 Founded in 2004 by philanthropists Donald and Shelley Rubin, the museum is home to their passionately collected, then donated, trove of Himalayan art, considered the best in the Western world. The museum displays its treasures in small galleries that radiate from a spiral staircase at the core. On a quiet afternoon, I decided to explore its many facets reflecting ancient truths. Shaking off the ghost of the building’s previous incarnation, Barney’s high-end department store, I could appreciate how the boutique museum enables a sly segue of mores between the end of the last millennium and now. Secular and spiritual pursuits not only coexist in this space, they thrive. Tim McHenry, a dapper Brit in his mid-50s, pulls wizard-like skills out of his hat as Director of Public Programs and Performance, and is very involved in creating these juxtapositions. On board for the museum’s eight and a half years of existence, it’s been on his watch that the public is routinely offered envelope-pushing events that are cerebral and inventive. Wanting to wrap my head around the whole cultural kaleidoscope, I ventured up the stairs to the more traditional galleries. First: “Gateway to Himalayan Art.” Here I learned that Buddhism and Hinduism spread side by side in the same Indian and Nepalese communities, their deities depicted in shared myths and even created by the same group of artists. Buddha himself is an incarnation of the Hindu god Vishnu. Words and symbols are explained, and a “how to” step-by-step process for hollow metal casting walks the viewer from a wax figure to a beautiful bronze Green Tara, with gilding being the final step of her metamorphosis. Feeling prepped for “Masterworks: Jewels of the Collection,” I climbed to the next level, which showcases the collection’s highlights. Here I discovered a room lined with the Lukhang murals, high resolution pigment prints from the Secret Temple of the Dalai Lamas. The Tantric Buddhist art depicts yoga asanas in their original form, primarily lotus pose, and meditation practices in vivid and complex detail, illustrating that Tibet links back to the yoga and Tantric adepts of India. Tucked around another corner is the Tibetan Shrine Room, offering a chance to view hundreds of sacred works of art: statues of Buddha and other deities, Thangka (scroll paintings), and various ritual objects arranged on traditional Tibetan furniture in a religious context that would exist in the private home of a wealthy family from this era. I thought of my own little wooden meditation shelf with its revered relic from the World Trade Center next to a tiny plastic Buddha, smiling at the discrepancy. Next, the Living Shrines of Uyghur China. Desolate, arid landscapes eerily punctuated by fragile, tattered grave markers drew me in for closer inspection of the large format photos. These sites are for Muslim saints, visited and tended to over the centuries by the rural pilgrims who have added spiritual tokens and prayers to the shrines. Off limits to most of the modern world, they were captured by Brooklyn photographer Lisa Ross, who visited the area for nearly a decade. The results are exquisite portraits of time- and wind-battered “art de l’assemblage” — sticks tied with strips of fabric, framed by crib-like enclosures–heartbreakingly transient yet anchored by faith. The Rubin Museum is, in fact, whatever people would like it to be: truth or illusion or both. It welcomes all and promises to astonish. And that promise is fulfilled.